Cherokee Creek Boys School is a therapeutic boarding school for middle school boys ages 11-15, in Westminster, South Carolina. We are a learning community that challenges boys and their families to discover what is real and true about themselves and the world around them. We offer the benefits of small enrollment, hands-on academics, therapy, counseling, recreation and a talented staff dedicated to helping boys find their way back to a life of balance and harmony. 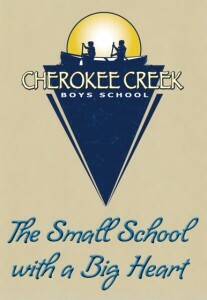 For more about Cherokee Creek Boys School, please visit our website or email us at info.cherokeecreek.net. Great job! I’m looking forward to receiving all the CCBS news! I’m sure every parent will benefit from this site. Spread the word! I can’t wait for the great words of wisdom that will come from this. I also hope people look to ccbs as a great place to send their boys when they are hurting. David, It is so good to hear of your great work. I have two girls (age 9 and 4) and wish there was somewhere like this for them. They go to a christian school and it is great, but Cherokee looks truly great. I am looking forward to reading any and all advice from other parents! This is a wonderful idea. my son, Albert, was amoung the first 4 students at Cherokee when it first opened! I still think so warmly of his time there. It gave me hope and strength to continue on the journey as a loving, supportive parent, what a hard and wonderful job it is! Rachel B. My boy is doing terrific keep up the good work. He wants to come to the next graduation of a friend. anybody have the date in Feb. 2010? Thanks Kimball. Our next graduation will be in May, but our next family seminar is Feb 11, and 12…Y’all are welcome anytime. Have a great break and enjoy your son. Great Job! I feel a little closer to Alec through this and the photos that come our way! Thanks to all the staff these make that possible. Looking forward to parent conference. I look forward to getting CCBS news! Thanks! I love the blog! Great work Davd, and David’s Mom . I find your writings very inspiring. I miss cherokee creek! Hunter is doing great. We are planning on coming back for alumni weekend in May! I am so grateful for ccbs and how it helped all of us! Dave, I am impressed. Looking forward to updates. We’ve made it through 3 weeks as members of the Cherokee Family. One Seminar, and I feel like we belong! Thanks to all who participated and helped us start this journey. David, my family spent 25 years gathering at Emerald Isle for vacation. It is still the “talked about” highlight at family reunions all with Christmas celebrations! Your advise is wise. As a mother with grown children, I look back on those days and it is such a good reminder that we never get these precious moments back. Stealing a classic line from the old movie “Love Story”…”Love is never having to say I didn’t spent enough time with my kids.” Blessings! another nice blog david ! Hunter and I had a great reunion trip to cherokee creek. Every day I am full of gratitude for the school! I love your Island teaching piece. My family has a beach house on the coast of N.H. that the boys and I have spent every summer ( except 1) since they were born and I spent every summer of my life there before they were born. It truly was the the most powerful family experience that I look back on. thanks for sharing. I just stumbled upon the blogs and am so glad I did. I love being able to stay connected with the boys and look forward to hearing more. Elliott is working hard and doing great… and we are truly blessed to have found CCBS. You all are a godsend.